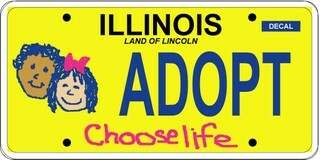 The State of Illinois has indeed decided to appeal Judge Coar's Jan. 22 ruling stating SOS Jesse White must begin issuing Choose Life adoption specialty license plates within 30 days, by Feb. 21. The State is throwing away the people's money on a case that legal precedent has shown it will ultimately lose. Last Thursday, Judge Coar suspended enforcement of his Jan. 22 order while the State prepares its appeal. The average time for appeals is almost a year. Our attorney, Tom Brejcha, is asking Judge Coar to vacate his stay pending the appeal. Tom will take this to the 7th Circuit U. S. Court of Appeals, one step below the Supreme Court, if the judge does not. Meanwhile, 3M, the company that provides sheeting for Illinois license plates, has submitted its final design to the Illinois Choose Life Adoption Specialty Plate Committee. More and more people are asking committee members about purchasing CL plates. CL Committee chair Jim Finnegan requests all who want to be first to order them to register through the web site, www.ilchoose-life.org.